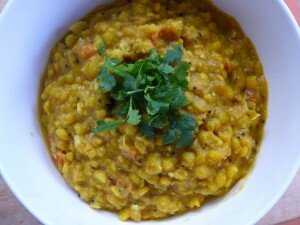 I know it is October, but I think making more dhal is my New Year’s resolution. I’m either late or early, I’m not sure which. Every time I make dhal I’m impressed by how easy and delicious it is, so I am not sure why I don’t make it more often. It has so much going for it. It is fast and easy to make, delicious, AND healthy. There are lots of different methods to make dhal. I am not the most confident Indian food cook, so I like this method where you cook the lentils (or peas, beans, or any other kind if pulse) until they are soft, then fry the spices in oil and add the lot to the cooked mix. This time I made the dhal with yellow split peas, but I’ve used red lentils when I want something quicker or black urad dhal (which is my favourite). I like to give mine a slightly sour taste with some tamarind paste or lemon juice. Wash and drain the split peas. Add to a large saucepan with 4 cups of water and the turmeric and cook until tender. By this time the water should have reduced. Pound the garlic and ginger into a paste with a pinch of salt in a mortar and pestle or chop very finely into a paste with a knife. In a small pan heat the oil and add all the spices and the garlic and ginger paste and fry briefly until they smell good. Add the spices and the oil to the split peas and stir. Add the chopped tomato and cook for another 10 minutes. Add some tamarind paste or lemon juice to give it a slightly sour taste. Need ideas for simple meals at this time of year!